The following is an information page that we put together in the early summer of 2011, a few months after the earthquake and events of March 2011 in northern Japan. We thought that we would publish the article here unchanged. As well as learning about the event you may get a feel of some of the emotions and issues prevalent at this time. Comments and feedback from people living in Japan can also be found here. It may seem a long time ago to most people now, but there are still many in north east Tohoku whose lives have been changed and still trying to regain a normal lifestyle. Our thoughts are with them. The following was first published in June 2011 and is reproduced here unchanged. In this section we will outline the events of March 11th and provide information regarding some of the ongoing issues as well as present some first hand experiences from people who live in snowy regions of Japan. We also try to address concerns about Japan as a tourist destination in the aftermath of the event. One important point to make - this is not here to try and sell vacations to Japan. The idea is to provide clear, balanced and honest information on the subject - something that we feel is especially important at this time. If you have any questions or want to discuss any of the issues brought up, please feel free to post on the Forums. It was a normal Friday afternoon for most people in Japan, but on that day many lives were changed by the massive earthquake and events that followed - now officially known as the 'Great East Japan Earthquake'. The 9.0 magnitude earthquake, which was the strongest ever recorded in Japan, occurred at 2:46pm on Friday, 11th March 2011. The epicenter was approximately 70km (43 miles) east of the Oshika Peninsular of Tohoku which is the northern part of the main island of Honshu. The closest large city was Sendai in Miyagi Prefecture. 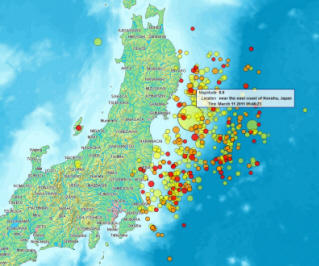 The map to the left displays the seismic intensity experienced in different regions throughout Japan, showing that almost all of Japan felt the original earthquake. 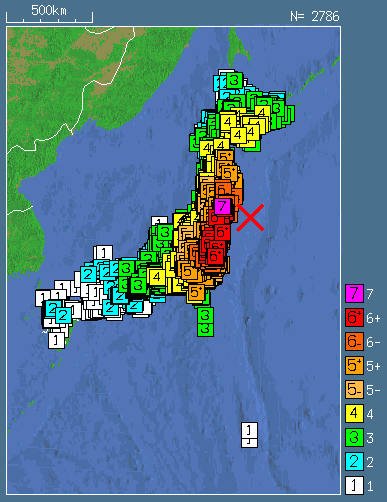 An explanation of the Japanese seismic 'shindo' scale shown on the map can be found here. The earthquake triggered destructive tsunami that soon after struck many coastlines on the Tohoku coast and in some cases traveled up to an incredible 10 km inland. The widespread damage that was dealt to many coastal towns has been well documented, but the images and video from that day remain just as shocking to see now and will likely never lose their impact. The image below shows the height of the tsunami in different regions of the Japan coastline and in some places the numbers greatly exceeded those displayed below. It is worth noting that the most casualties and damage inflicted during this tragedy were actually brought about by the tsunami on that eastern coastline rather than the main earthquake itself. If all of that wasn't enough, at 3:59am on the following morning, Saturday 12th March 2011, a strong (unrelated?) earthquake rocked the north eastern part of Nagano Prefecture and the Chuetsu region of Niigata Prefecture. Perhaps because of the scale of the ongoing events happening in Tohoku, this did not get the media coverage that a magnitude 6.7 earthquake would normally receive. However it was strong enough to in fact cause a considerable amount of localized damage especially around the village of Sakae in Nagano Prefecture. The nearby popular ski resort of Nozawa Onsen also saw some damage to some of its facilities but remained open for the rest of the season. These earthquakes and tsunami were bad enough, but then on Saturday we were introduced to the problems at the Fukushima Dai-ichi Nuclear Plant in Fukushima Prefecture. It is important to understand that 'Fukushima' is in fact a very large prefecture covering an area of close to 14,000 square kilometers. Fukushima is the southernmost prefecture of the Tohoku region and divided into three regions - Aizu, Nakadori and Hamadori - and has a total population of over two million people. Fukushima is also the name of the city that serves as the seat of prefectural government. And as we all know, the word Fukushima is also used in the name of the TEPCO Nuclear Power Plant where they are experiencing ongoing problems brought about by the earthquake and tsunami. In the immediate aftermath of all these events, worries over power supplies meant that some planned power blackouts were required and rolled out in the Kanto region for a short while. Restrictions were also put on the consumption of gasoline and some shortages of food were also experienced in some regions. While the Japanese government is still presently encouraging people to conserve electricity as much as possible with a target of 15% less usage than usual over the summer months, there are currently no power blackouts and also no food or fuel shortages. The Japanese media remained impressively calm in its reporting of the disaster. In the following days overseas mass media outlets seemed to take joy in producing sensationalized reports containing factual errors and generally stoking up fear. The whole situation Japan was facing was of course extremely serious. As it turns out there were some serious issues reported by the foreign media that proved to be correct, but for many people their apparent intent on presenting unrealistic and/or fantastic worst-case scenarios rather than presenting the facts was distasteful. This contributed to causing real alarm amongst some foreigners living in Japan and also their families overseas. Some foreigners in Japan even temporarily left at the request of their families who were panicking about safety after reading such reports. As you can see on the chart above, almost all regions of Japan felt the the initial earthquake on March 11th to some degree. 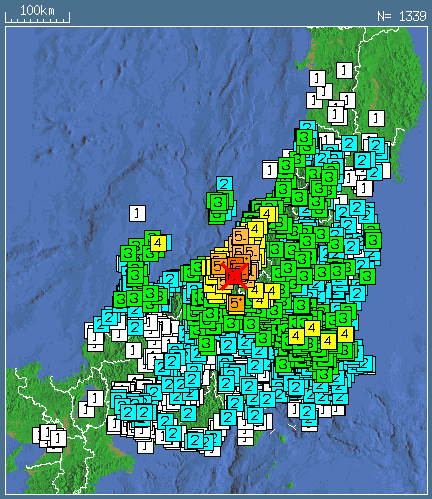 It was felt very strongly in most regions of Tohoku and beyond on the northern part of the main island Honshu... less so on the northern island of Hokkaido and in west Japan. Ultimately, there was very little damage to the infrastructure of ski resorts throughout the country - even to those in the Tohoku region. Apart from a small number of exceptions in Tohoku, the infrastructure and facilities at the vast majority of ski resorts in Japan were totally unaffected by the earthquake and none were affected by the tsunami. Many ski resorts in northern Japan did close for at least a short time even if it was just to check facilities, and some did cut their season short in an effort to save electricity. Unfortunately, the ones that remained open saw a drastic drop in the number of skiers and snowboarders out there on the slopes and hotels experienced many cancellations making it a very quiet end to the season. Popular resort areas many hundreds of kilometers away from the affected areas which were totally unaffected by the tragedy saw visitors disappear. To get an idea of how the situation was in many of the main popular snow resort regions of Japan, please read our feedback page here where people living in those regions tell us about their experiences. So what about next ski season? It seems that bookings for next season are generally very slow. Resorts and associated businesses that increasingly rely on the inbound market are worried that people overseas will decide to avoid Japan. It would be a great shame if people decided not to come to Japan based on inaccurate information or sensational headlines. By the time November 2011 comes around, ski resorts will be ready just as normal for the coming snow season. June 2011 - what's the situation now? At the time of writing, it is over three months since March 11th. There are still plenty of major problems facing people in the affected areas and progress in the work to contain and cool down the reactors at the Fukushima plant is continuing. That work will likely take until early 2012, but as things stand this does not apparently pose a high danger to areas outside of the immediate vicinity of the plant. There have been literally many hundreds of aftershocks spread over a large region on the east coast in the few months following the main event. A fair few of these have been strong earthquakes in themselves. While the threat of more strong aftershocks does remain, the frequency and strength of the aftershocks has gradually decreased and should continue to do so. Japan is of course no stranger to earthquakes, and on any given day there will be some rumbling going on somewhere in the country. Following March 11th Japan seemed to go into a mode of mass 'self-restraint'. Perhaps understandably, people were not feeling in the mood to go out, spend money and generally enjoy themselves. It just didn't seem right to lots of people given what was happening in Tohoku. Mass cancellations and the lack of new bookings has certainly already affected tourism within Japan - both with Japanese tourists and the inbound market. This mood of self-restraint thankfully shows signs of changing now as the Japanese people realize that life needs to go on as normal, otherwise there will be economic casualties to add to the woes inflicted directly by the natural disaster. Should I still consider visiting Japan after of all this? It is understandable that people might think that it is best to avoid a region that has just been hit by a large-scale natural disaster. But as noted earlier, most of the damage is on the eastern coastline of Tohoku and for the most part ski resorts in Japan were unaffected by all of these events. Many of the ski resorts in Japan are hundreds of kilometers away from affected areas. The 2011/2012 season will go ahead as normal. Perhaps it is the Fukushima nuclear plant incident that is the main area of concern for people considering visiting Japan. Everyone will of course have to make their own decisions on that issue, but as long as the areas surrounding the plant itself are avoided it is safe to say that there should be no real cause for concern. That area is not even close to any ski resorts, so someone visiting Japan to ski would not be going to that particular coastal region anyway. To get a good idea of the location of popular ski resorts in Japan relative to the Fukushima nuclear plant, please take a look at the map that we have prepared on the experiences page. For those interested in being part of such things, visiting Japan would also be one way to help support the country as it gets back on it's collective feet. Japan certainly does not want people to desert her at this time. Please do take a look at page we have prepared regarding radiation concerns as well as these other resources and also that honest feedback from people who live in the snow town regions of Japan. Hopefully, armed with clear information and reading first-hand experiences and reports, you will be able to make your own informed decisions about visiting Japan. Feel free to drop by our Forums to have a chat on the subject or ask any questions you have or voice concerns - there's always someone around to give feedback. Read some comments and feedback from people living in Japan here. A few of us involved with running this website have had a few fairly traumatic earthquake experiences ourselves including the Chuetsu Earthquake in Niigata Prefecture back in 2004, so we know all too well the effects that a big earthquake and constant aftershocks can have... not just physically but also on the mind as well. It's a very stressful experience and one of those things that is difficult to fully understand without actually experiencing it. Of course, the events of March 11th were on a different scale altogether for those people living in eastern Tohoku and we truly feel for the people affected by them and send out our very best wishes. It is heartbreaking to see some of the images and hearing some stories from affected areas. Having said that, the way in which Japan and it's people have coped with the difficulties they face is truly inspirational and makes us proud to live here and be part of this society. Japan is a wonderful country full of wonderful people. Oh yes, and wonderful skiing and snowboarding too. After reading the facts, and if you feel comfortable with it.... hope to see you on the slopes.